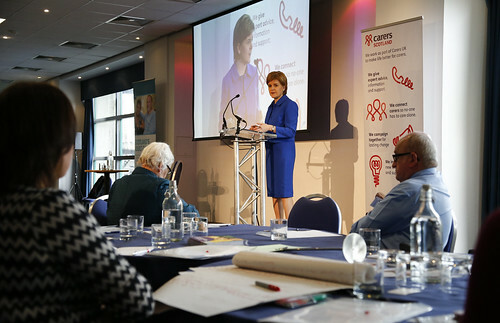 First Minister Nicola Sturgeon took part in the fourth meeting of the Carers Parliament, held at the BT Murrayfield Stadium in Edinburgh this morning. One of the Scottish Government’s key manifesto commitments was to establish an annual Carers Parliament – a forum providing carers, young carers, and carer representatives from across Scotland an opportunity to discuss and debate matters important to them. It provides an opportunity for Ministers and other stakeholders to engage with carers and young carers, to hear of their knowledge and experiences, and participate in a themed debate. 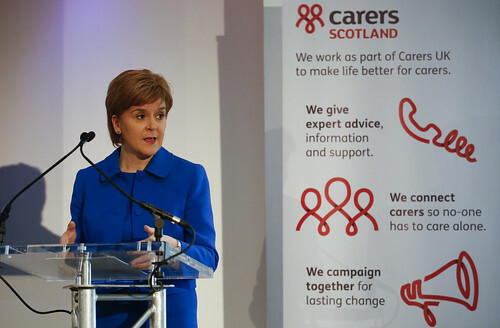 This morning was no different, the First Minister was able to make the keynote address to a packed room, outlining the Scottish Government’s support for carers and thank them for the tireless work that they do. The First Minister said Holyrood could only make the new carers’ allowance genuinely fair and effective with the full devolution of power over the eligibility criteria. At present, the Scotland Bill would see restrictions on education; employment and age remain with Westminster. Ms Sturgeon confirmed that the Scottish Government would seek to remove the eligibility clauses to allow the new carers’ allowance to work more effectively for carers and the people they care for. Ms Sturgeon also said the Carers’ Bill, currently making its way through the Scottish Parliament, would significantly strengthen the support for carers in Scotland as she confirmed it would be amended to enshrine emergency planning – for when carers are unexpectedly unavailable – in the care plan process. The First Minister also confirmed the new legislation would ensure that carers would be protected from being charged for the support they receive – including when replacement or respite care is needed. Following the speech, the First Minister took the opportunity to speak to a smaller group of carers, representing a range of carers’ groups. They were able to openly discuss the challenges that face them and how the Scottish Government can continue to support them.